Free tool which allows you to upload your images and share them with others. Innovative software program downloads from the best in download websites! Browse the featured software applications types, watch the latest updates of the featured tools, and download directly! Do not miss opportunity to recieve the hottest apps: employ SoftEmpire directory to setup software programs for free. Have a look on the accumulation of free utilities and software application releases. pick out among Windows services programs, get manipulators, playgames, and all other kinds of programms for your PC or cellular stuff! HostJPEG is a popular free photo hosting service that comes in really handy to share photos on the spot. And now with Image Uploader it's even easier to use! 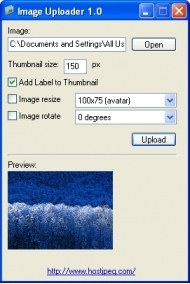 Image Uploader is a free easy-to-use tool which allows you to upload your images and share them with others. You can embed these images directly into your website and use the auto generated thumbnails. After a while - it will take some time to upload the picture, especially if it is high-resolution - your picture will be uploaded to HostJPEG, and Image Uploader will display a bunch of different links to share them online on forums, websites, and more.